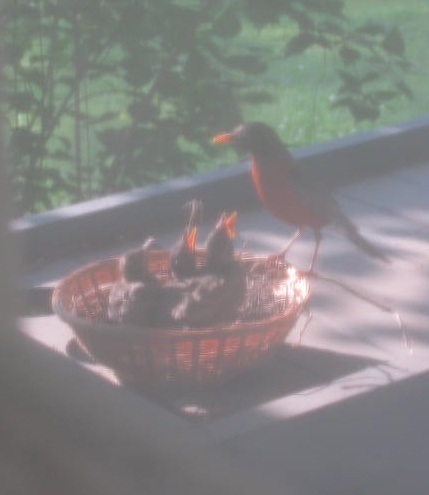 A few weeks ago, I posted about a robin who had built a nest next to our kitchen door. She laid eggs and they hatched, all four of them. It was a small nest. And the babies grew quickly. And then this happened. We were alerted to the catastrophe by the adult robins. They were screaming hysterically in bird language. One baby was still half in the nest and half out, clinging to pieces of dry grass. It was like the emergency room on Grey’s Anatomy. And I was chief of the ER. I couldn’t take a picture because 1) I didn’t have my camera, and 2) I was standing under the nest with my hands cupped to catch the last baby bird in the event that it lost its grip. 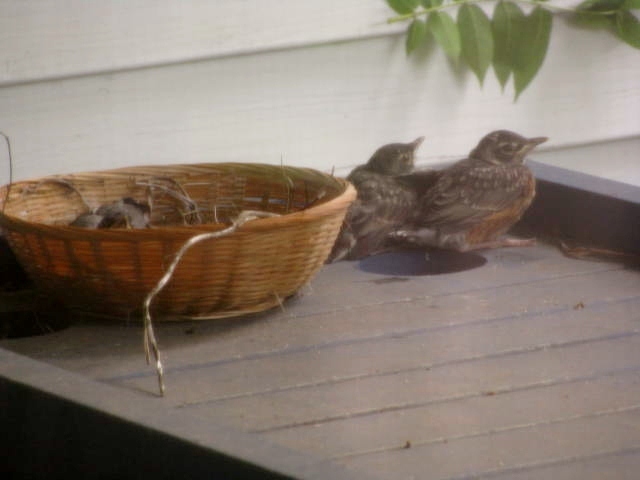 The other three birds had fallen out, about six feet down to the wooden porch floor. Two survived the fall. Sadly, one, the smallest, did not survive. I noticed, while attempting to replace the nest with my gloves on, that the mud portion of the nest was as dry and crumbly as dirt in a desert. 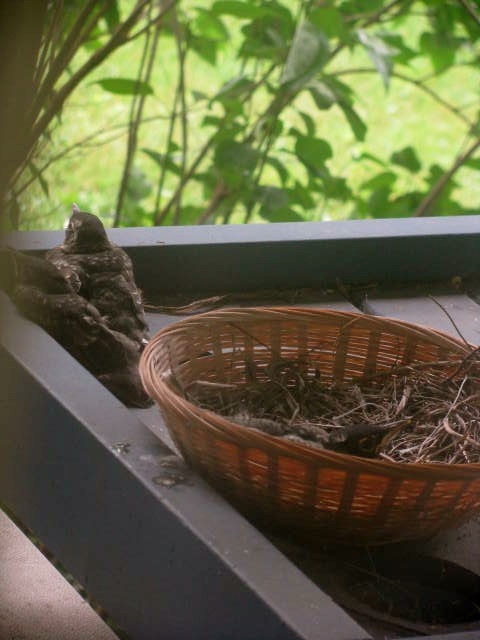 I am not an expert, but because this nest was built on a covered porch where it was protected from the elements, it did not have the benefit of being rained on occasionally. 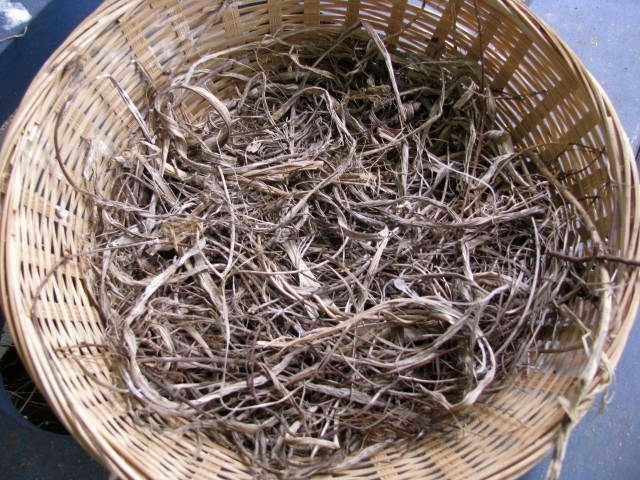 Therefore, the mud dried and it lost its glue-like quality that had previously kept it bonded to the porch light. That is this non-bird-expert’s assessment of the reason for this nest failure. We could not get the nest to stay in place again, and even if we could have, the birds would no longer all fit. I didn’t want to put the babies through the trauma of falling out again, which I know is probably part of “survival of the fittest”, however, the remaining babies were not going to die on my watch. So we improvised. 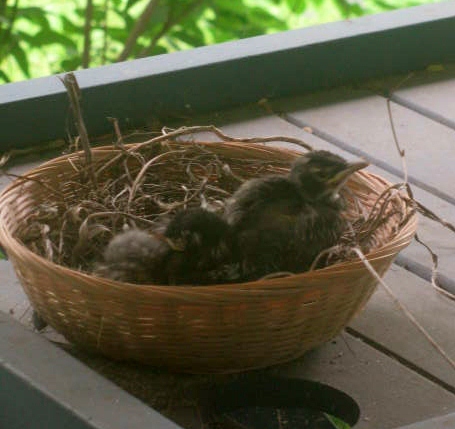 We put the bits of the nest that had fallen on the porch floor into a disposable wicker basket and the babies had a new, temporary home. I wasn’t sure if the Mama Robin would approve, but she did. I took this picture right after we moved them from the floor to the basket. Mama was in a nearby tree, coaching them to “lie flat and look mean!” Then we went into the house and pushed the sheer curtain aside to peek at them through the window. As soon as we were gone, they got up from their crouched positions and looked more lively. The Mama, however, was not so easily fooled. She could see us looking out the window and she didn’t like it. This photo was taken through the sheer curtain, hence the distorted colors and grainy quality. Not to be outsmarted by a robin, we left the sheer curtain in place. I wanted to watch because my concern was that she would not return to care for them and we I would have to do it. Through the curtain, she could not see us but we could watch her feed the babies. Yeah! However, she would not sit on this new nest, but as long as she returned to feed and clean up after her babies, I was happy. The Mama lived in a tree next to the porch while they grew. And grew. And grew. 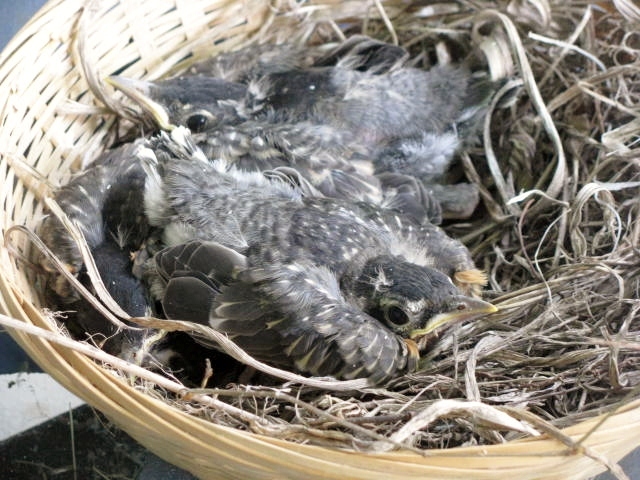 Four or five days later, they hopped out of the nest. They flapped their wings a little bit. And then they were gone. Et alors ils ont été allés. I hope they remember to come back to visit next year. I miss them already. What a sunshine story … with happy ending – how lovely. Thank you so much for sharing and caring – your photos are great too. Awwww…I loved this. And you are an expert in my book. Funny too. I think the photo through the curtain is actually kind of cool…who needs Instagram when you have a sheer panels? Thanks for saving the babies! 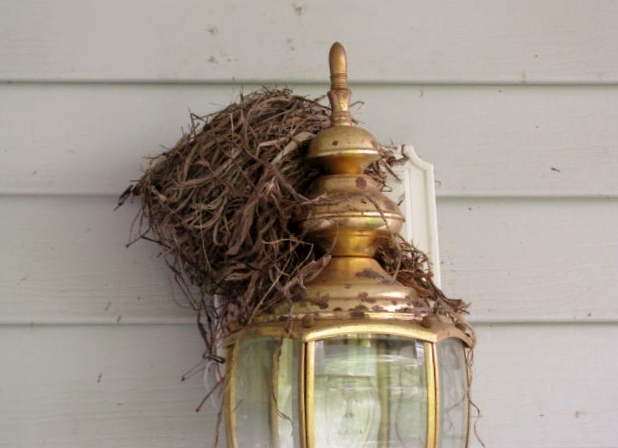 I hope you are recovering from…wait for it…”empty nest syndrome”. LOL!